This one is very interesting at 7:55 -- people who think NASA personnel are not in on the scam in the past and present can observe 'Alan Nadell's' 'Adele's' (sp?) behaviour, and the Frank Hughes character referenced throughout. There is some further footage somewhere where Alan gives Jim the bum's rush for asking about the hatch measurement. See also 11:54 and the problem with hypergolic fuel but no dark red smoke from the lunar lander. Last edited by SydneyPSIder on 22 Dec 2012, 07:43, edited 1 time in total. BELOW: This next NASA fake comes courtesy of Apollo 15. In most movie sets, the crew will take a picture of the set to try and frame it correctly before they start shooting with film. The same thing here. 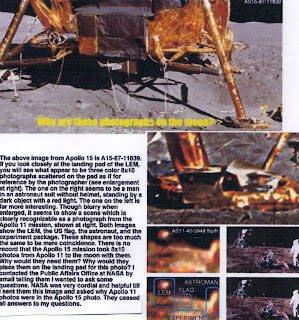 It's just that some absent minded photographer forgot and left the polaroids on the leg of the lunar module.......dohhhh! 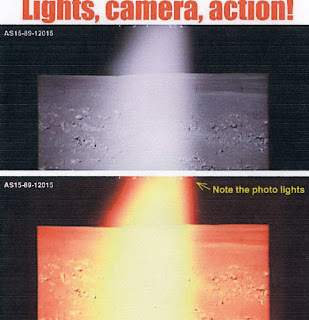 BELOW: We think the photographers for Apollo 16 need to frame their phony pictures better. You can clearly see 6 studio lights at the top of this "Lights Camera, Action" picture. BELOW: Every one of these pictures is of Buzz Aldrin from Apollo 11. Apparently he can't figure out how he wants to dress. In some pictures his moon suit is tucked into his moon boots, in some they are not. In some pictures his gloves are white, in some they're grey. Some pictures he has an antenna...and some he doesn't. One picture shows him wearing a black arm band...and it disappears in others. Last edited by SydneyPSIder on 28 Dec 2012, 19:51, edited 1 time in total. Regarding there being diffused light on the moon: I can't see anything other than harsh light in any published photo. Show me one with diffused light, please. Last edited by The23rdman on 21 Dec 2012, 22:51, edited 1 time in total. I've removed all the extraneous posts from this topic and put them here: viewtopic.php?f=12&t=2645&start=0. Now here's the thing. If you don't like the way a discussion is going, then start your own danged topic and specify the terms and conditions in the OP. If you have something of value to add in an already started topic, then by all means add it but don't whine about how others want to discuss a topic. The23rdman wrote: Regarding there being diffused light on the moon: I can't see anything other than harsh light in any published photo. Show me one with diffused light, please. The picture foreground of the bear rock looks like it's been shot in strong daylight in the desert somewhere. The middle ground and background have much more diffuse and softer light IN THE SAME PHOTO. i.e. the soil around the rock in the fg is extremely bright and reflective in the harsh sun, but the rest of the lunar landscape 'soil' or 'moondust' is very muted, implying the use of sets or front projection techniques or other photo fakery. The entire photo should be absolutely brilliant like the fg. This is not the only photo showing this effect in existence, of course, there are plenty more. Last edited by SydneyPSIder on 22 Dec 2012, 19:50, edited 1 time in total. The lighting is quite 'muted' also. I have no idea but I found that pic to be VERY INTERESTING. Can anyone enlarge the astronaut's face plate on this photograph? SydenyPSIder, did you pick this up on your own or did you find this in another researcher's research? Also, could this photo be taken from a tripod to be clear? Did the astronauts at any time take pictures not using their chest cameras? Let's be sure and cover all bases. Misha wrote: Can anyone enlarge the astronaut's face plate on this photograph? SydenyPSIder, did you pick this up on your own or did you find this in another researcher's research? Also, could this photo be taken from a tripod to be clear? 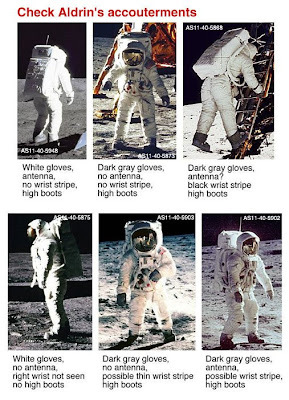 Did the astronauts at any time take pictures not using their chest cameras? Let's be sure and cover all bases. 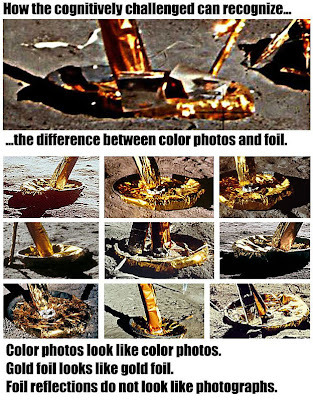 Ditto goes for the provenance of the other pics, although many have the NASA ref no on them and can presumably be verified, although that's not completely certain if NASA takes them down or alters them. There was a point where one researcher downloaded every pic and reference number available on NASA's website for analysis, then came back to find NASA had completely renumbered all the pics 'for some reason'. Now tell me you didn't use me to make a point? Frankly, I have seen this still many times but was giving you the gentleman's benefit of the doubt to explain. 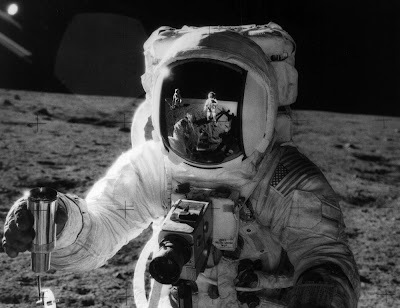 If I am correct this is Apollo 11 with Armstrong taking a picture of Buzz Aldrin. Now Sydney, what do you mean by "punked?" Addendum: Correction, Conrad. As pointed out by ProfWag. Last edited by Misha on 22 Dec 2012, 22:29, edited 2 times in total. Apparently they sent one wacked-out stoner geo on the final 'mission', Apollo 17, Harrison Schmitt, who stumbled across this unusual rock, colloquially called the 'bear rock' by them I believe. It's actually called "Split Rock," Syd. SydneyPsider wrote: The only problem geologically with this picture is that split boulders such as the one shown are either caused by a boulder falling from a rocky crag, or ingress of moisture which later freezes and expands. Neither of these are possible on the Moon at that location. It was actually formed as a result of thrown rock from a meteor, Syd. Look at this photo! (BELOW) It’s once again Pete Conrad from Apollo 12. Look in his visor. There are two astronauts reflected. How is that possible? That means there must be THREE astronauts on the surface of the moon! There should be only two, while the third remained in orbit. That is actually a faked photo, Syd. Please note the photo towards the bottom of this referenced webpage to see that the "3rd" astronaut was cropped from a completely different photo. It appears, Syd, that you have been "punked" by your own conspiracy believer friends. Thanks, ProfWag. My confusion. Actually, I think Syd was doing the "punking" which I look forward to his reply. Thanks Prof. Yes, I had found the same evidence for photoshopping.